Envision a world of free access to information on health care, education or development. Join our quest to make this vision a reality! the Foundation works for optimised content delivery on capacity-limited networks through low cost infrastructure, addressing areas with low admission and/or no Internet coverage. the Foundation performs research and development to achieve free access to information as part of sustainable infrastructures. Digital inclusion is a key for health, education and meaningful work. Connecting developing economies with free access to information through the alliance of IT, Telecom, Academia, and public sector partners will create the partnership for achieving the Sustainability Development Goals (SDG 2030). The unique alliance, addressing a common mission and best praxis for partnership in digital access, will build the basis for sustainable development, a catalyst for achieving the SDGs and business acceleration in Africa. (i) Local governments, as digital inclusion is vital for six key sectors: health, agriculture, education, retail, government and financial services. (ii) The people themselves to gain access to information related to education and healthcare, and finally more employment, income generation and productivity growth for everyone. (iii) Companies that realise the market potential behind this vast number of people currently without access to Internet and, therefore, without market exposure. This may not be in terms of the purchasing power of each inhabitant, but as a result of the mere number of people. 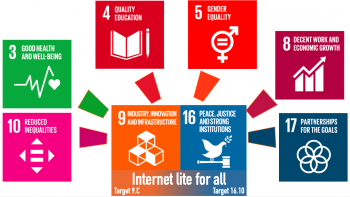 The UN Sustainable Development Goals (SDGs) have identified “access to information and communication technology and strive to provide universal and affordable access to the Internet” (SDG target 9.c). Though mobile operators play an eminent role, partnership is needed to address the digital access to remote villages and provide information access to people otherwise left left behind. The World Bank’s 2016 World Development Report on Digital Dividends (WDR 2016) reports on opportunities of digital technologies and digital access. Digital access is the key for digital development being the positive driver for sustainable and inclusive development. 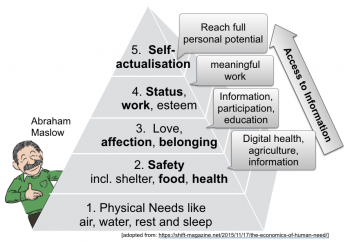 Internet Lite for all will help the unconnected to reach the next steps of the Maslow pyramid, by providing access and information for food and health, and enable the further reach to levels 3-5 for everyone. The WDR 2016 report also highlights the risks that exist if digital societies are only limited to those already being better off. The Foundation was established in December 2014 as collaboration between The University Graduate Centre (UNIK, since 2016 University of Oslo) and Kjeller Innovasjon AS. The impact of Basic Internet for the Digital Society is seen as a continuation of Internet deployment from Kjeller, starting with the Arpanet deployment in 1973, and with Opera Software in 1994.